Yes, I put which aisles these items are found. As you get to know your stores you’ll know where the items are kept (they hardly change). Take a look at this picture. Does it look similar to your store? 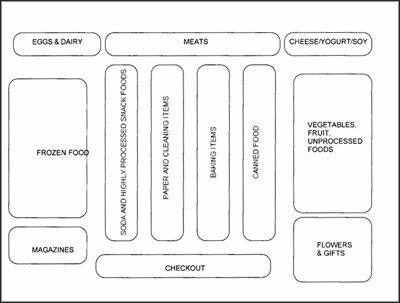 These are universal concepts in store layout and design. You’ll notice that most of the items you need are in the outer edges of the store. I’ve noticed that I’ve reduced the number of steps and in-store time by 75% by planning ahead–it was part of an experiment where a friend and I shopped for the same items except that I planned ahead knowing the general location of each item. We both wore a pedometer and timed ourselves. Remember to take inventory of your ingredients in stock, and then make your organized list before you go shopping.